There are many brands of garage door openers on the market today that offer new features designed to make life easier. In the beginning garage door operators performed one simple function, they allowed you to open and close your garage door with the push of a button. 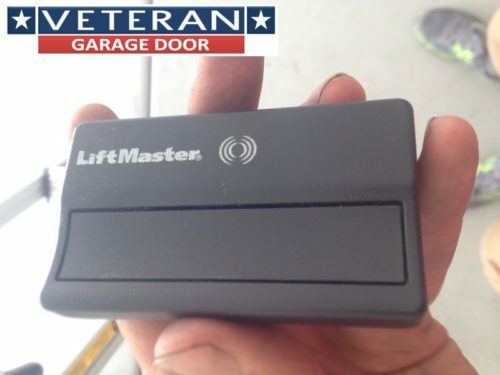 The automatic garage door opener simply replaced the physical action of opening and closing the garage door with a machine that did it for you. Over the course of time, the criminal element of society found ways to defeat the remotes for garage door openers, this is sometimes referred to as cloning. Since the early garage door openers operated on set frequencies, cloning was fairly simple. Todays garage door openers operate on new frequencies and now they operate on some version of rolling codes. What does this mean? If someone were to clone the frequency that just opened or closed your garage door, it would be useless to them because with each push of the remote, the opener and remote roll to a new frequency code and the one just cloned will not work again. 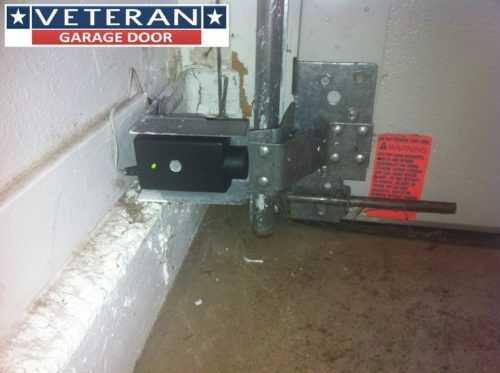 This has addressed much of the problem with garage door opener security. Todays garage door opener market is definitely leaning to whole home automation, with everything in your house, including your garage door opener being controlled by an application from your smartphone or tablet. We recommend LiftMaster products as they provide the highest quality products with all of the conveniences people are looking for with there MyQ applications. If you are looking for a basic chain drive opener, then the LiftMaster 8165 chain drive opener provides the reliability you need with the built in MyQ feature at a reasonable cost. If you are wanting a quiet opener with even more features the LiftMaster 8550W belt drive opener would be a great choice. The 8550W offers the smooth quiet function of a belt drive opener, MyQ technology built into the opener, battery backup for times the power is out and the added security of automatic bolt lock compatibility. The automatic bolt lock is fairly new to the garage door opener industry. This feature allows you to purchase the automatic bolt lock that works in conjunction with the garage door opener. When installed the automatic bolt lock unlocks automatically when the door is opened using any method of opening, if you use the wall console, remote, keypad or your smartphone or tablet. The automatic lock also locks each time the door is closed when using the automatic opener. The automatic bolt lock is a secondary lock feature that attaches to the garage door track and the bolt locks through the track, above one of the rollers and prevents the door from being opened when the bolt is locked. If security is a priority, this automatic bolt lock makes it very difficult for your garage door opener to be defeated by the criminal element. The final option we will talk about is the jackshaft opener. These openers allow you to clear up some of the head space in your garage as they take away the need for a opener rail that the garage door attaches to. Jackshaft style automatic openers attached directly to the spring bar and can be mounted to either side of the garage door. Jackshaft openers are very quiet and strong. The problem we encounter with jackshaft openers is the prewire in the garage themselves. Most homes today are prewired for a standard opener with a plug installed in the ceiling of the garage at the location a standard opener would be installed. 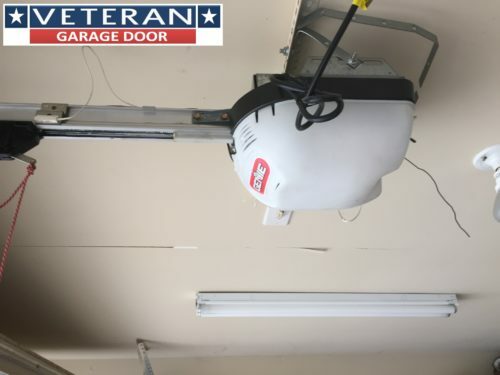 Many home builders also have prewired the home for garage door safety eyes and the wall console, but again these pre wires are run to the ceiling of the garage where a standard garage door opener would be installed. These prewire issues can be taken care of by simply stapling wires to the garage door ceiling and routing them to the jackshaft opener or having an electrician rerun the wires for the jackshaft opener. Jackshaft openers also require a power source near the garage door header since the opener mounts and attaches to the spring bar. Jackshaft openers have fewer moving parts and are a great choice. The LiftMaster 8500 is the entry level jackshaft opener and requires a MyQ bridge to work with a smartphone application while the 8500W has the MyQ built in along with a battery backup. 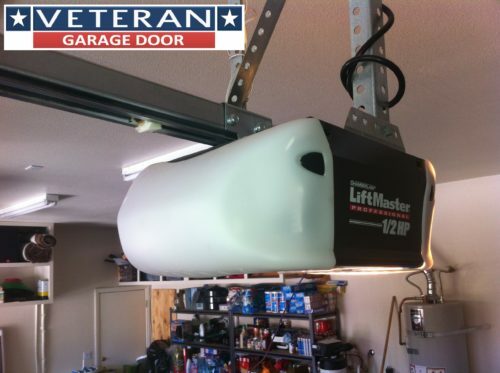 Both the 8500 and 8500W are compatible with the automatic bolt lock and come with a wireless light that can be mounted anywhere in the garage.